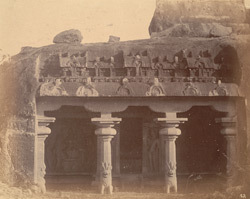 Photograph of the Varaha Cave Temple at Mamallapuram, Tamil Nadu, from the Archaeological Survey of India Collections taken by Alexander Rea in the 1880s. Mamallapuram, a tiny village south of Madras, was a flourishing port of the Pallava dynasty during the 7th-8th centuries. The site is famous for an early group of monolithic temples, known as the 'Pancha Ratha' and some monolithic sculptures assigned to the 7th century reign of Narasimhavarman Mahamalla (r. c.630-668). This view shows the Varaha rock-cut cave temple which dates from the late 7th century. The columns of the verandah have lion bases, typical of the Pallava style. Inside, in the middle of the rear wall, there is the shrine flanked by guardian figures. On the side walls there are large sculpture panels representing Vishnu Trivikrama and Vishnu as Varaha, the boar, lifting Bhudevi, the earth goddess.